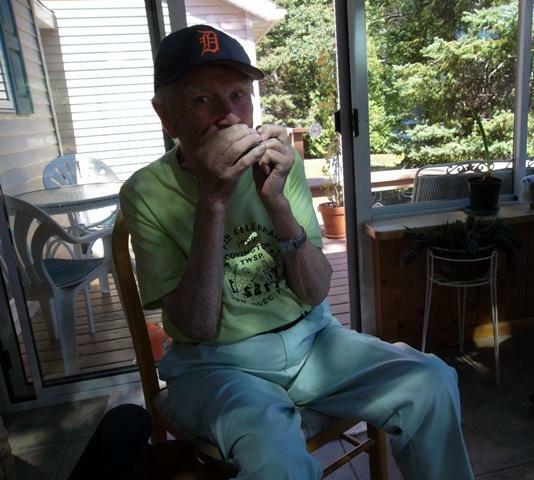 Les Ross, Sr received the Michigan Heritage Award in 2009 for his "lumberjack" style of harmonica playing. 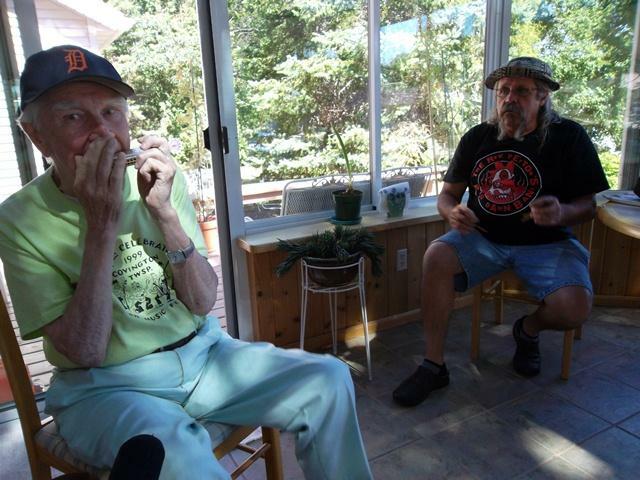 Les Ross, Sr on harmonica and Randy Seppala on bones and spoons. Together they play traditional folk music and lumberjack music. The folklorist Alan Lomax spent nearly two months in the Upper Peninsula in 1938, recording the music of the north woods. He recorded lots of bawdy lumberjack tunes, Finnish songs and polkas. In a note to the Library of Congress, Lomax said "there was material enough in the region for years of work." Today, most of that music has been lost to history. But Leslie (Les) Ross, Sr still plays it. Born in 1923 in Eben Junction, Ross is one of the last harmonica players in the country to play in the "lumberjack style." As part of my Stories from the North Woods series, I sat down with Les Ross and percussionist Randy Seppola. With Ross on harmonica and Seppala on bones and spoons, they played me a number of old-timey tunes, and Ross talked about his days in Eben Junction and, of course, the harmonica. 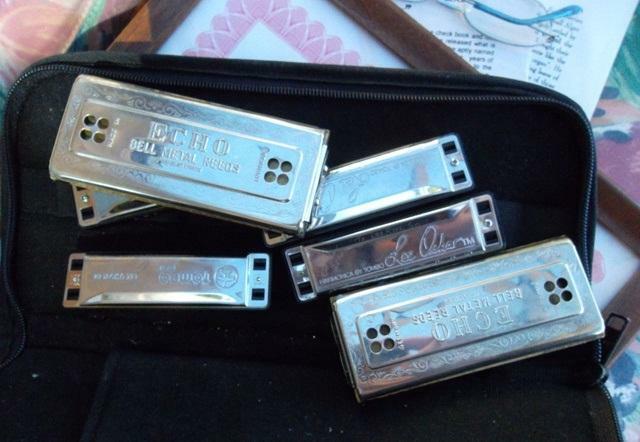 "My grandpa gave me a harmonica. When I used to walk home from school, I’d help him with chores, he was up in age. I started just playing it," says Ross. His parents and two sisters played the harmonica, too. Ross plays in the "lumberjack style," which means he plays "the chords and melody at the same time." 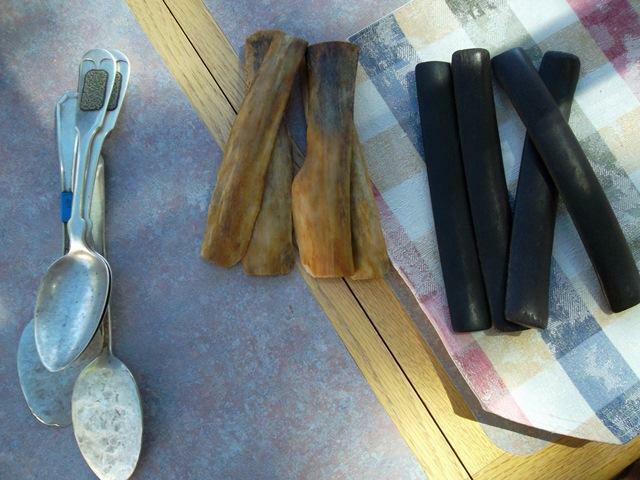 Ross says the Finnish name for it is Hulivili Huuliharppu. "Hulivilli means 'happy go lucky,' huuliharppu means 'harmonica.'" Percussionist Randy Seppala says lumberjacks used to "make up lyrics to the songs of the day and sing them in the shanties in the evenings." He says the lyrics were "kind of raunchy," and neither he nor Ross would translate the Finnish lyrics for me. "I still remember those songs when I was young," says Ross. "The lumberjacks used to sing [them]. I was in the Blue Moon Tavern there in Eben, and I’d buy them a beer and have them sing some more songs and I memorized them." Seppola and others hope to record Ross playing and singing the lumberjack songs so they can "get them down for history." Les Ross, Sr was awarded the 2009 Michigan Heritage Award for his lumberjack-style harmonica playing. You can listen to two of Alan Lomax's recordings from his Songs of the Michigan Lumberjacks collection. The audio was provided by Dan Truckey, director of the Beaumier U.P. Heritage Center in Marquette, Michigan. Sung by John Norman at Munising, Mich., 1938. Recorded by Alan Lomax. "Jack Haggerty" or "The Flat River Girl" is one of the most widely known shantyboy songs of Michigan origin. Flat River is in what once was the great pine belt of Michigan, rising in Six Lakes, with a fine mill-site at Greenville, the scene of the story, and emptying into the Grand River near Lowell. The ballad was composed in the late sixties by a burly Irishman named Dan McGinnis who was both a clever entertainer and a good raftsman. The circumstances which inspired McGinnis to compose the ballad are related in Lore of the Lumber Camps and They Knew Paul Bunyan. The curiously garbled second line in John Norman's second stanza means something like "My virtue's departed, by a lass I'm defamed," and of course the "dark blots" of the following line make reference to Cupid's darts. Sung by Gus Schaffer at Greenland, Mich., 1938. Recorded by Alan Lonlax. In the cypress swamps of Dixie, in the Northeast and the Northwest, in the lumber camps of the Great Lakes, and from Nova Scotia to British Columbia the lumberjacks sing their alphabet song. No two versions are exactly alike, but they all follow the pattern of this one sung by Gus Schaffer from Greeland in the upper peninsula of Michigan. Every singing jack seems to have his own chorus, on which he expects the boys in camp to join him. Many other trades have their own alphabet songs along the same lines as those of the lumberjack. "The Sailor's Alphabet" is sung by Captain Leighton Robinson on Library of Congress record L2 "P is for Peerless," the brand of chewing tobacco well-known in the lumber camps of Minnesota, Wisconsin, and Michigan. Peerless was strong enough for Paul Bunyan himself. The ending is strictly Schaffer's; the song is more likely to end with something like: W is the woods we leave in the Spring And now I have sung all I'm going to sing. *Support for arts and cultural reporting on Michigan Radio comes in part from a grant from the Michigan Council for Arts and Cultural Affairs and the National Endowment for the Arts.